PlanetPOV will host a live chat beginning at 8:00 am PST this morning to accompany President Barack Obama’s inauguration for his second term. All PlanetPOV members are invited to join us for this fun and live discussion on this historic day. 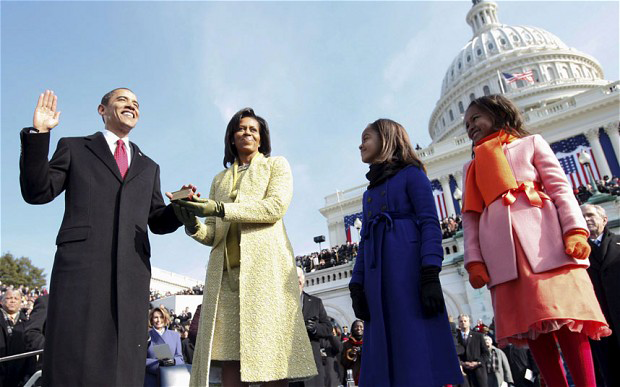 A scheduling note, President Obama’s inauguration speech is scheduled to begin at 8:30 am PST. You can participate in our live chat in the Live Events window in the right column on every page or on the Live Events page for a fuller view of the chat. President Obama has just prefaced his inaugural speech with bold and decisive action on the Bush Tax Cuts and gun control, with immigration reform lined up for later this year. With his legacy in mind, President Obama may have quite a memorable speech lined up for this morning, hope to see you here for it and our lively, real time discussion. Congratulations America, you chose the best, and we of the liver-spotted, old fashioned, greedy and uncaring leaders across the globe are a little jealous about what you can achieve with a caring man as your leader. Well done! Kalima! LOL!!! I’d not thought about the “leaders” elsewhere, but I think you nailed it. Yes -- we picked this one wisely after maybe 40 years of not so much. What’s stunning to me is that for those of us who do policy wonky stuff and know the inside strategies and heavy lifting that goes on, he has turned out to be FAR BETTER than we’d ever dreamed. Never thought I’d have a president who was MORE than I’d hoped. He is not only grounded in the values we care about, he defines success in the “art of the possible”. In very base terms, he’s a GREAT poker player: know when to hold ’em, know when to fold ’em. I really love this president. I’d say I love him “warts and all” but I’ve not detected any of the latter. Nor in his running mate who appears to be the first Veep to be BFF with his president. That duo is amazing. And the First and Second ladies of the land absolutely rock, individually and together. This was a happy day. Not a liver-spotted grump to be seen. Enjoy from afar, Kalima -- he’s president of the US but a citizen of the world. Hi cl, I think that many Americans just don’t know how lucky they are in having a caring, intelligent and progressive president. They should try living in some other countries before they start yelling that he is taking away their freedoms, they have no clue what that really means. I lived in Germany as a child so had no worries, everything was done for me. In England I became an adult, and although it wasn’t perfect, I never felt threatened by any laws as many Brits are feeling threatened now. Japan wasn’t my choice, I came here with my husband, but as a foreigner have less rights than the population. Things have improved a little over the years, but after over 30 years, and married to a Japanese, I’m still required to carry my “Alien Registration”, yes that’s what they are called, every service in my house is registered in my husband’s name and my name is not on the deeds to our house, and should something happen to my husband, the paperwork involved for me to continue to live here, would fill a battleship and probably take years to complete. In the first 10 years here I was finger printed every time I renewed my alien card. After decades of protest by S. Koreans living here, it was finally abolished, but there is talk of introducing it again by the newly elected RW government. So when I read stories and sometimes post them in the mornings, I realize how lucky Americans are, and that many of the so called infringement of rights and freedoms are just in minds of fanatics, because basically, you have rights that millions of people around the world can only dream of and will probably never experience in their lifetimes. We of the liver-spotted, know-nothing politicians can only hope that one day we could be as lucky as to have a President Obama fighting for us. Yes, I will be watching from afar as always and cheering you all on. I still have friends who are not insured yet, so until every American has health care, the fight continues. Fortunately I have more faith in your president than some in your country because I can see the whole picture from over here, and sometimes you have to take a deep breath and take a step back to actually see it. These are going to be four very interesting years thank goodness, because had Romney stolen the election, I was seriously thinking of giving up blogging, that is how much I despised the man and everything he stood for, or rather claimed he stood for. I’m happy that I’m still here. Oh btw, I saw where President Obama used the “we the people” in his speech and hope that it reminds people of the reasons why America was founded and for whom it was founded. People power is a glorious thing once it takes hold, we should never forget our right to protest for change. The only way to keep our voices being heard is to use them. Your eyes, outside looking back, are a critical part of our “reality testing” about what is important. Americans have become spoiled brats, even among those who don’t have a lot. We bought the Reagan mantra -- government IS the problem -- as if it made any sense. What uneducated white person living in a trailer and marginally employed actually benefits from current corporatist policies? Why have they bought the line? Is race REALLY that important? The only real function of skin is to keep your guts from falling on the floor. Other than that, it’s pretty meaningless as a way to distinguish those picking your pocket and those sharing your experiences. I do think we’re turning the page -- that was the theme when I sat 20 feet from BHO at the CA Dem Convention -- and that’s what scares the power brokers. We’re NOT falling for it all anymore. Witness the election. Witness new polling from guns to choice -- the world is turning back toward equity, fairness, justice. We can’t be bamboozled forever. I would wish for youth better understanding of Civics, yes, because they do prove Lincoln’s adage that you can’t fool all of the people all of the time. I just wish they would not fall quite so often, quite so long. A bit of understanding about how democracy operates, how Congress works, MIGHT help keep things in better persepctive. But I’d urge you to go global with your observations -- America:a view from overseas -- to remind us ALL who we have as president, and what good things we have as a nation. Might be a major wake up call! Hugs and thanks for all your wonderful writing and reflections! Rest assured cl that I continue putting people straight about what is really going on in your country because unless they follow your politics as closely as I have for the last five years, many are grossly misinformed and just repeat what they have heard about from others. Take for example a very dear German friend living over here who came after the President had just won his first term. Seeing how happy I was about this, she started to tell me things that could only have come straight out of a Republican handbook. Later I found out that her American friend who voted for McCain, had been feeding her Republican nonsense and propaganda for months. Knowing it wouldn’t be fair to tell her that she had been mislead without providing proof, I started to send her articles to prove without a doubt that she had been fooled by factless lies. The whole process took almost a month, but it proved to be worth it, and during last year’s election, she had remembered enough to dispute her American friend who was voting for Romney. The same with people and family I know in England, Europe and North Africa, they too had fallen for the RW lies, maybe because they were not as interested in politics as I am. I agree with your impression of young people not knowing enough about government, but know that it is the same all over the world and can’t help wondering that if we had more honest politicians, they might show more interest in what is going on around them. When there are so many frauds and liars in positions of power, it’s hard for anyone to find someone they feel they can trust, and the young are more impatient than we are. Also I’m afraid, just that more selfish than we were. I don’t know many things about the way your government is run, but I know a lot more than most foreigners I speak to so it is a pleasure to keep people I meet informed about how wrong they are about the majority of Americans. I have skin in the game, I have a lot of newer American friends, and some I have known for over 30 years. They are important to me, and I want to see them survive and prosper in a country that accepts them all, even if they are poor and sick, or have fallen on bad times. We are all equal in the eyes of the God I believe in and love. I hope that we can get something constructive done over the next two years. I am glad that he is president. I would not want either an ’emoprog’ or a ‘tea partier’. Both are the ‘prisoner of his passions’. I love Joe Biden! That man is enjoying his job today! Who else but the propagandists at Fox and on the RW would cherry pick something like that out of a speech like this? God bless America and our President. I hope he has some cooperation this time from the republicans. Okay, I’m fired up and ready to go!